This compact and high performance engine delivers the ultimate power and performance. Get the advantage of the most advanced 4-stroke outboard technology in the industry with features like; Multi-Stage Induction, Variable Valve Timing, and a powerful 32-bit Electronic Fuel Injection computer working together to optimize low- and top-end torque. The industry's narrowest V block which offers a well-balanced design that fits today's boats. Also, two-stage gear reduction with the lowest gear ratio in its class for marvelous acceleration and top-end speed. The lower unit is designed with a powerful 2.29:1 gear ratio. This allows the torque generated by these engines to turn a larger prop that can move a lot of water. Our exclusive 55-degree V block and proven offset driveshaft give Suzuki's V6 4-strokes a narrow, compact design that is the perfect fit for a wide range of today's most popular boats. This design moves the center of gravity forward for better balance and less vibration. With our 3.6-liter displacement computer controlled electronic fuel injection and powerful 2.29:1 final drive gear ratio, the DF250, DF225, and DF200 deliver maximum torque across the powerband. You'll always have plenty of power the moment you ask for it. And our high-output 54A alternator provides plenty of electrical power for electronics. Our flagship V6 range provides the perfect power for both leisure and commercial craft. As part of our sole supplied agreement with the London 2012 Olympic and Paralympic Games Sailing Regatta, the DF200 was one of the models used to power support boats. 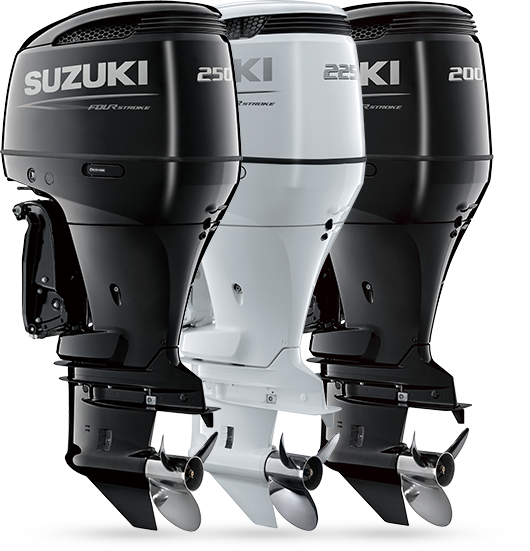 This was Suzuki's fourth Innovation Award and proof that Suzuki leads the way in fuel-injected 4-stroke outboard motors. Nobody Delivers More Performance-Enhancing Features Than Suzuki. The DF250 incorporates Suzuki's advanced Variable Valve Timing (VVT). 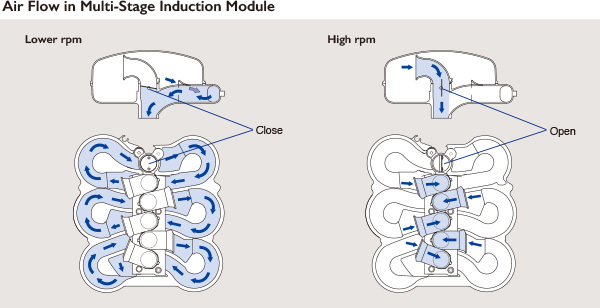 VVT is used to alter intake timing with the camshaft to optimize camshaft timing for low to mid-range operation. Combined with the outboard's aggressive cam profile VVT delivers greater low to mid-range torque for powerful acceleration. Suzuki's formulated Suzuki Anti-Corrosion Finish starts with a special finish that offers maximum bonding of the finish to the Suzuki Aluminum Alloy. To this an epoxy primer undercoat, black metallic finish, and clear acrylic fiber finish are added to create an effective treatment against corrosion. This finish can be found on all Suzuki line-up models. Advanced multi-point sequential electronic fuel injection monitored by the 32-bit onboard computer keeps Electronic Fuel Injection performance fine-tuned. At the same time, fully transistorized ignition provides a hotter spark with less electronic interference. 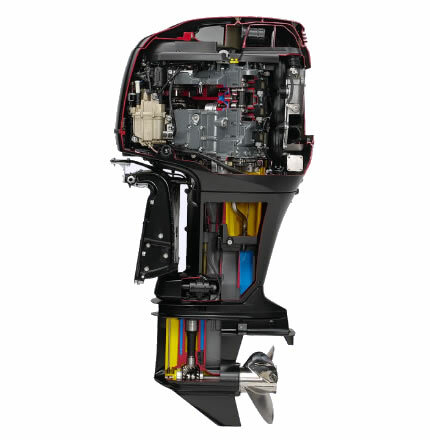 Thanks to our exclusive 55° bank angle and offset driveshaft layout, you get power and performance from a sleek, compact outboard that’ll look great on any transom – especially yours. Suzuki's advanced four stroke technologies deliver cleaner, more efficient operation that conforms to the Recreational Craft Directive (RCD) Standards and has received a three-star rating from the California Air Resources Board (CARB). Suzuki's two-stage gear reduction results in a 2.29:1 gear ratio. We swing a large diameter prop designed to move a lot of water – and a lot of boat.